TIMELINES? CHEW ON THIS FOR INSPIRATION. Wrigley’s Extra Gum gets emotional. So do 20 million YouTube viewers. Most chewing gum advertisements are boring, boring, boring. They either rely on product features, tangible benefits (like preventing bad breath after eating garlic or some spicy food) or some idiot acts stupid in the mistaken idea this will boost sales. Last year, however, Wrigley’s USA made a gum commercial that really tugs at the heart strings. 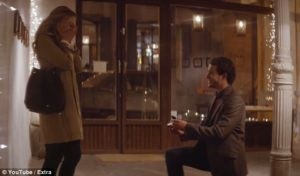 The ad follows the love story of two students – Sarah, an American girl (who is actually an English actress from Doncaster), and Juan, a Spaniard. They meet in high school and Sarah offers him a stick of Extra gum, beginning a relationship that progresses through a timeline. This charts their graduation from high school and moving away to different universities, but they stay in touch. As the timeline progresses, Sarah and Juan appear older. 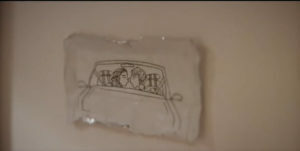 Juan invites Sarah to a private gallery where a series of frames on the wall feature Extra chewing gum wrappers, each one bearing a sketch of the things they’ve done together over the years. Juan gets down on one knee and opens a box to reveal a sparkling ring. Figure out the rest yourselves. All of this is acted out while a cover of Elvis Presley’s ‘Can’t Help Falling In Love’ by Haley Reinhart, an American Idol contestant, plays in the background. You can watch the ad here. It doesn’t surprise me in the least that the response to this ad was amazing. After all, as I keep banging on, we are emotional people, making decisions based on emotion and being led by emotional responses. The advertisement has, at the time of writing, been watched nearly 20 million times, with just about everyone commenting about crying their eyes out (including macho males confessing to being reduced to blubbering wrecks). Facebook ‘likes’ are over 90 million. And, importantly, Wrigley’s Gum (part of the huge Mars empire), reported a double digit growth for gum sales. US ad agency Energy BBDO has produced a highly creative ad. But the timeline idea is nothing new. It’s been used for decades to generate a story that can be packed with emotion, as life unfolds before us. I’ve featured John Lewis in my Brand Blogs before, and they are masters of the timeline. In 2010, their ‘Generations’ advert featured a female character, depicting the way in which she interacted with the John Lewis brand throughout her life, from a young child to becoming a grandparent. Again, there’s a beautifully matched soundtrack of Fyfe Dangerfield singing the Billy Joel song ‘Always A Woman’. You can watch the extended version of the ad here. A timeline is a brilliant way to show your brand as an emotional experience. You can use a past-present-future, past-present, or present-future theme as a story line. You can even use future-present, looking back from a future time. The timeline needn’t even stretch over years. It could be just a day in the life of a person, product or service, with an emotional connection running throughout the scenario. It doesn’t really matter what approach you take, providing there’s a transition from one period of time to the next, creatively executed and emotional in content. In my branding workshops (you should try one), I play the John Lewis ad by way of example, then get everyone to create a timeline for their own company, product or service, based on an emotional foundation, not a tangible one. Hear me, dear readers. No tedious babble about the history of the company and its founder(s), no verbiage about a product’s antiquity, no chronology about factories, offices, machinery and other wearisome verbosity – unless there is pure emotion running through it (and that’s highly unlikely). Storytelling is, without doubt, one of the most successful ways to build a brand. And a timeline is the perfect partner to communicate an emotional story to your customers. Maybe it’s about time you incorporated a timeline into your ESP (Emotional Selling Proposition).